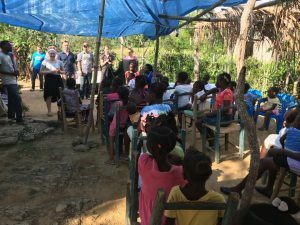 This year a group of Young Adults at Church of the Rock ventured to Haiti for a short term missions trip from April 28 – May 8. The team consisted of 11 people: one experienced leader, two returning team members, and eight who went for the very first time. community of Ranquitte where the local pastor – Pastor Lulu – has set up six house churches in the nearby areas. These house churches lead Bible studies on a weekly basis, serve in their community, and attend corporate worship. 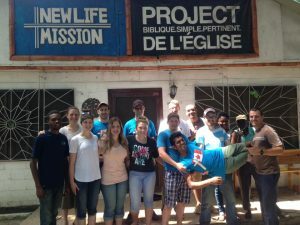 The team spent three days at one house church participating in something never before done in Haiti – Adopt a Block. While door to door visitation is a typical afternoon venture, this time the team asked the Haitians they visited if there were any acts of service they could do for them. They often lead with “we’re young, hard working people who want to bless you with free labour”. 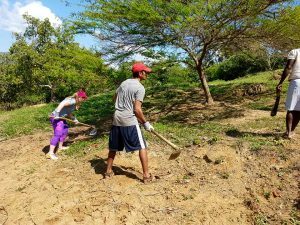 The team worked side by side with Haitians as they helped with farming, such as tilling the land and planting plantain trees. They also collected water, washed dishes, picked cotton seeds, and helped move a paralyzed lady outside of her house so she could enjoy some fresh air. She had not been outside in 7 months. The team washed her feet and kept her company for a while. One highlight from this time was helping a local witch-doctor till his farm. He was invited to the evening service and asked questions about voodoo. While he didn’t attend church that evening, it was the teams prayer that he was blessed by the Christians who worked for free for him that day. Each night the team participated in a church service where they shared personal testimonies and acted out mimes. The explanation of these mimes were then tied together with the testimonies. At the end of many of these services, the team offered to pray for the congregation. For many team members, this was the first time they had prayed out loud for so many people on a daily basis. The second work project the team participated in was in the community of Savon Gra. Here the church is in need of a new roof, but before that project could be approved, one of the supporting walls that was caving in needed to be replaced. The team worked on completing a foundation for the new wall. This meant that various piles of large rocks would be transported by hand up a cliff to the work site. The team worked tirelessly passing rocks in a line, building team spirit as they went. They also pickaxed the trench for the new wall, and helped move large bags of cement and rebar. This work site was particularly difficult because the church is located on the side of a mountain. The truck that typically transports the team throughout Haiti can only get part way up the mountain before the team has to get out and walk the rest of the way up. Near the end of the trip, the physical labour ended, but the team was challenged in more spiritual and emotional ways. The weekend brought visits to a local hospital – where the team prayed for people with spinal cord injuries, a visit to a local Children’s Home – where the team shared Bible skits and crafts, and played sports and games with the kids. At the hospital, one of the team members got to lead a lady in a prayer to accept Jesus into her life. She had never heard of Jesus before and after having Christianity and the work of Christ explained to her she was excited to accept Him into her life. After a while that team member went back with the local missionary to follow up with the lady and discuss how to go about getting her a Bible. The team also went to Milot, a touristy city where they helped distribute food to the sick and elderly. A crowd of children gathered around as they went from house to house praying for the people. These times were stretching for the team as they witnessed people living in hard situations, often without much help from anyone around them. All in all, this trip was one full of new and exciting experiences. The team got to witness God’s hand move in peoples lives as the gospel was preached and lives were touched. Praise God!